Properties in Wyuna Bay average 4.6 out of 5 stars. Property 1: Poppy Apartments ~ Stunning Views! Waterfront Vista in Wyuna Bay. Property 9: Waterfront Vista in Wyuna Bay. "Sky House" Amazing Views and luxurious. Best place to stay!! Property 14: "Sky House" Amazing Views and luxurious. Best place to stay!! A hop, skip and jump from the door into the water! Property 15: A hop, skip and jump from the door into the water! Cute Colville Farm House - be active or RELAX !! Property 21: Cute Colville Farm House - be active or RELAX !! 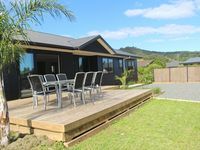 Stylish and Peaceful Heritage Listed Cottage - 4 bedrooms & 2 bathrooms. Property 27: Stylish and Peaceful Heritage Listed Cottage - 4 bedrooms & 2 bathrooms. Bay Watch ~ Wyuna Bay ~ Stunning Harbour Views! 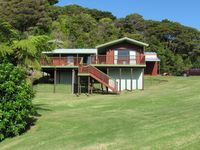 Property 35: Bay Watch ~ Wyuna Bay ~ Stunning Harbour Views! Fisherman/Family/Friends - Close to Beach & Township. WIFI and Sky TV. Property 47: Fisherman/Family/Friends - Close to Beach & Township. WIFI and Sky TV. Thanks very much for a wonderful break the accomodation was fantastic, house was clean and tidy we hope to be back next year! Peaceful with heaps of room for parking utes and boats. Great bait fridge and filleting bench. Barbecue worked a treat!! Comfortable inside and awesome deck area too. Downside maybe the sofa bed in the lounge, but two bathrooms a bonus!! Awesome few days away! !